Ciro Petrucci at Petrucci Yachts tells me he's signed the 45m gentleman's motor yacht No Lo Se for sale. 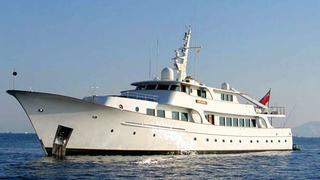 Built by Abeking & Rasmussen in 1974, she's had several upgrades and recently emerged from a two-year refit. Accommodation is for 10 guests in five spacious staterooms and she has an impressive 4,500 nautical mile range at 12 knots. Lying in Lavagna, Italy, No Lo Se is asking €6 million.